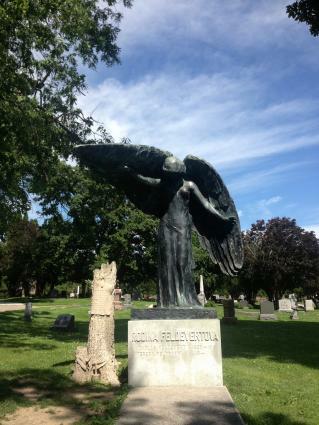 The black angel is a supernatural icon of Oakland Cemetery in Iowa City, Iowa. 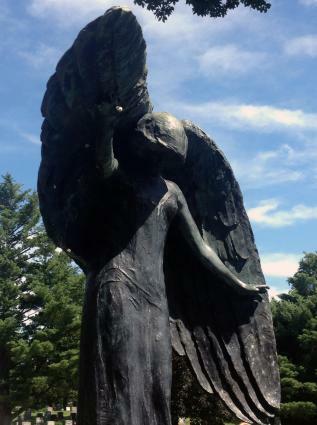 The angel statue is the Feldevert family burial monument placed in the Oakland Cemetery in 1912. When the 8.5-foot statue turned from a polished bronze to black, stories that the angel was the tool of supernatural forces made it a local legend. Strmilov, Bohemia immigrant Teresa Dolezal and her son Eddie moved to Iowa City in the late 1800s. Dolezal was a physician in her country, but practiced as a midwife in the U.S. In 1891, 18-year-old Eddie contracted meningitis and died. Teresa buried her son in the Oakland Cemetery with a tree stump carving used for his grave monument. She then moved to Oregon where she met and married Nicholas Feldevert, who died in 1911. Teresa returned to Iowa City with her husband's ashes that she had interred beside Eddie's grave. She hired a Chicago artist named Mario Korbel to design an angel to stand watch over her son and husband. On November 21, 1912 the angel arrived in Iowa City via train. The angel is an eerie sight and doesn't portray the typical angelic being most people are accustomed to seeing in cemeteries. This angel is poised looking down upon the gravesite with its wings hunched over. This pose creates a spooky image that certainly must have been fodder for the many stories surrounding the statue. Conflicting stories about when the statue was erected add mystique to the legend. One story claims the statue was immediately placed at the gravesite when it arrived at the train station. Another story details a lawsuit Teresa initiated against the artist, citing that he hadn't created the statue to her specifications. According to the story, a replica bronze tree stump was supposed to be featured beside the angel. This omission was the crux of Teresa's lawsuit against the artist. Allegedly, the angel statue was stored in a barn for six years and Teresa eventually lost the lawsuit. It's assumed she paid the $5,000 owed to the artist, since the statue was eventually installed at the gravesite. The original tree stump monument was then moved and set beside the angel statue. When Teresa died in 1924 from cancer, her ashes were placed underneath the angel where her husband's ashes also resided. A few years after the angel was placed at the gravesite it started turning a greenish black color. The natural oxidation process of metals, including bronze, will turn the shiny metal green and then a dark brown or black over time. In fact, depending on the amount of copper in the bronze, that process can occur fairly quickly. The quantity of copper in the Black Angel bronze statue is unknown. However, as with all good ghost or supernatural stories, there are many tales about why the statue turned a sinister black color, none of which have to do with the natural chemical process. One tale paints Teresa as betraying a fidelity oath she swore to her dead husband. It's said that she swore the angel would turn black if she ever betrayed her solemn vow. Other stories claim that Teresa's practice of unspecified evil rituals and wicked deeds are responsible for the angel turning black. This tale unfolds on the night of Teresa's funeral when, allegedly, a lightning bolt struck the statue and turned it black. A more macabre explanation states that Teresa killed her son and fled Oregon. Her guilt and shame drove her back to Iowa City to seek forgiveness and her penitence was to commission the angel statue in the hope that it would assuage her guilt. Unfortunately for Teresa, the statue quickly became a symbol of her evil past. Whatever the truth is about Teresa and the statue, the reputation of the Oakland Black Angel makes it a popular hot spot for paranormal enthusiasts. Whether they are based in superstition or the supernatural, the scary stories surrounding the angel and its evil power over the living have thrived for over 100 years. Several supposed rituals and curses have arisen from these stories. A girl kissed in the moonlight while standing at the angel's feet with die in six months. Touching the angel on Halloween results in death within seven years. Instant death occurs if you kiss the angel. Any woman who was kissed at the angel's feet in the moonlight would die in six months. Touching the angel on Halloween would lead to death within seven years. According to the Iowa City government website, Oakland Cemetery is located at 1000 Brown Street. It is open from 7:30 am to 9:00 pm every day and visitors may tour the grounds, including the Black Angel. Be sure to take the time to visit the monument if you're in the area, as it is truly a sight to see in person.